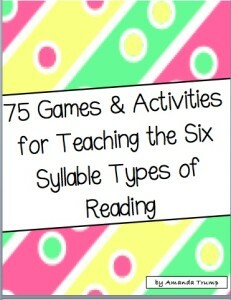 The bundle packet includes 75 games and activities that all target teaching the 6 types of syllables in reading: Closed Syllables, V-C-e Syllables, r-Controlled Syllables, Open Syllables, Vowel Digraph & Diphthong Syllables, and Final Stable Consonant Syllables. The basic overall purpose of learning syllable type reading is to give students 6 reading strategies to aid them in chunking longer words into short, readable parts. 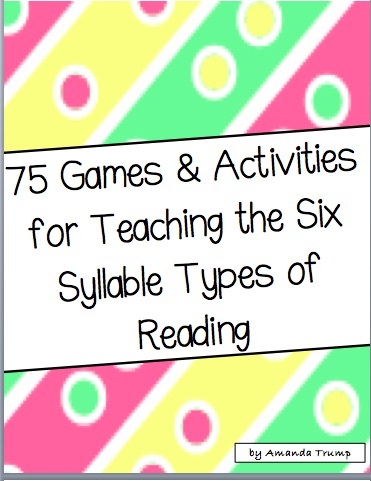 Learning to read by identifying the type of syllable is the most consistent method to teach reading to your students, and the easiest way for your students to learn to read.These 75 activities/games can be placed in language stations, or they can be played during small groups. So enjoy as your students learn another way to break the code to reading!At the present, I am creating my last packet of game and activities to go with the final stable syllable type, and once I complete it, I will make it available. Also, if you would like to preview what is in the packet, just click on the preview tab and you can see a sample of some (not all of them) of the games in the packet.